Did you know that you can use essential oils for cooking too?! Just a drop or less can add tons of flavor (and health benefits) to your raw or cooked dishes! But… which oils should you start with? And, how do you use them anyway? On today's #AskWardee, I'm sharing the top 5 essential oils for cooking along with tips for how to use and which recipes they work best in. Q: Favorite Essential Oils For Cooking? I'm ready to dip my toes in the water … cooking with essential oils, I mean. 🙂 Can you share the top essential oils you love to use in cooking and how/what you use them in? Thanks so much, Wardee! First… Is It Safe To Use Essential Oils In Cooking? Here's more info on safely ingesting essentials for culinary and medicinal purposes. Done properly, it can be safe. And, we always advise to play it safe wherever there is doubt (especially with infants, children, and pregnancy). 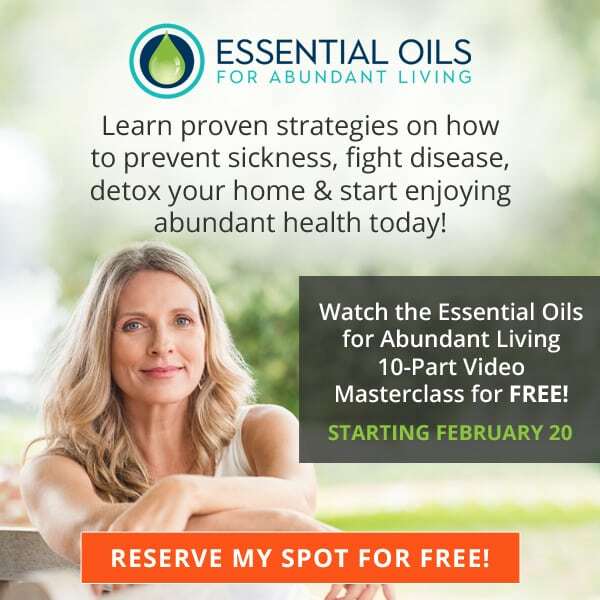 If you'd like to go more in-depth on essential oil usage and safety, be sure to register for a FREE 10-part video class on essential oils put on by my good friends Dr. Eric Z and his wife Sabrina. It's coming up soon, so register now right here. They're sharing tips and information for making healing remedies for your body and non-toxic natural recipes for your home… all with essential oils! Lemon essential oil infuses sweet and savory foods with a bright, lemon-y zing. It's like liquid sunshine! It also adds digestive and immune benefits to your uncooked dishes. Use In: Salad dressings, ice cream, no-bake cookies, yogurt, smoothies, and marinades. Quick Tip: Excellent in any recipe calling for fresh lemon juice! One drop of peppermint essential oil is equivalent to 28 cups of peppermint tea! Used in raw recipes, peppermint essential oil is an excellent digestive aid and can help get rid of an upset stomach within minutes. Use In: Ice cream, fudge, smoothies, cookies, brownies, cheesecake, and bars. Quick Tip: Peppermint is fantastic paired with chocolate or citrus. A little goes a long way! Basil essential oil contains powerful antioxidants and can improve digestion, reduce water retention, and even kill internal parasites. Use In: Italian dishes, salad dressings, meatloaf, ice cream, homemade mayonnaise, and hummus. Quick Tip: Even a drop may be too much, so add to dishes by dipping a toothpick into the bottle and then dipping the toothpick into the dish. Fresh and energizing orange essential oil can boost your digestion and immune system. Very versatile, orange essential oil can be used in both sweet and savory dishes. Use In: Anything chocolate, granola, smoothies, ice cream, Asian dishes, no-bake cookies, dressings, cookies, yogurt, fruit dip, tea, and cheesecake. Quick Tip: When a recipe calls for orange zest, use 1 to 2 drops orange essential oil instead. Blood orange is great, too! Cinnamon bark essential oil treats urinary tract infections, protects the kidneys, improves digestive health, and relieves a toothache… while adding pungent, spicy, warming aroma and flavor to foods. Use In: Muffins, quick breads, cookies, cakes, frosting, pies, oatmeal, granola, pancakes, and waffles. Quick Tip: It's very potent, so dip a toothpick into the bottle, then add to food! Keep in mind that essential oils should only be added to recipes containing some fat. Because they are an oil and oils only mix with other oils (fats), this guarantees that they will be diluted throughout the dish. You also need to know… the 2 methods for subbing/using essential oils in cooking. Add them to your dishes at the end after the food has cooled to preserve the aroma and nutrition. One drop is like one teaspoon of dried herbs. Or, in the case of bold herbs — such as thyme, basil, oregano, rosemary and marjoram — only a tiny bit is necessary. First, dip a toothpick into the bottle and then dip the toothpick into the food. Stir, taste, adjust. Lemon, lime, peppermint, or orange extracts can be replaced by essential oils. And, they're yummy! Replace each teaspoon of extract with 1 to 2 drops of essential oils all the way up to 1/4 teaspoon (25 drops) of essential oil. Start with less and increase until you get the desired flavor. Remember that flavors can intensify so it's best to use less rather than more! This is added because it came up in the comments… Thanks for the follow up question, Jackie! Use 1 to 3 drops of a citrus essential oil to replace 1 teaspoon of citrus zest. The zest from 1 citrus fruit would be 8 to 14 drops of the citrus essential oil. Start on the low side and increase to taste as needed. I've been given the green light to invite you to a free 10-part video class on essential oils put on by my good friend Dr. Eric Z and his wife Sabrina. It's coming up soon, so register now right here. Click here to save your seat! It's FREE! Finally, always choose high-quality oils, such as the oils from our recommended sources, Rocky Mountain Oils and Aroma Foundry. They're top-notch and affordable. FREE “Essential Oils For Abundant Living” 10-Part Video Masterclass — Hurry! It starts soon! What are your favorite essentials oil to use in cooking? How do you use them? I use a drop of two of EOs to replace my extracts, not a 1/4 tsp. I agree! Start slowly with a few drops and increase from there. I said that in the video but needed to update the text above. It’s clarified now. Thanks, Helene! I did buy the Ultimate Bundle and bought a necklace with the leather bracelet and then paid for the essential oil container shipping fee. Could you direct me to how to receive the essential oil? We had a free roller bottle offer for the Ultimate Healthy Living Bundle. Also, last year, for the Essential Oils bundle we had 2 free essential oils. Both of these offers have expired. They had a 30-day expiration. What would be the guidelines for substituting essential oils for lemon zest and orange zest? For example, my recipe for Swedish Limpa sourdough bread calls for the zest of one orange. You can use 1-3 drops of a citrus oil for 1 tsp of citrus zest. The zest from 1 citrus fruit would be 8–14 drops of the citrus essential oil. Start on the low side and increase to taste as needed.